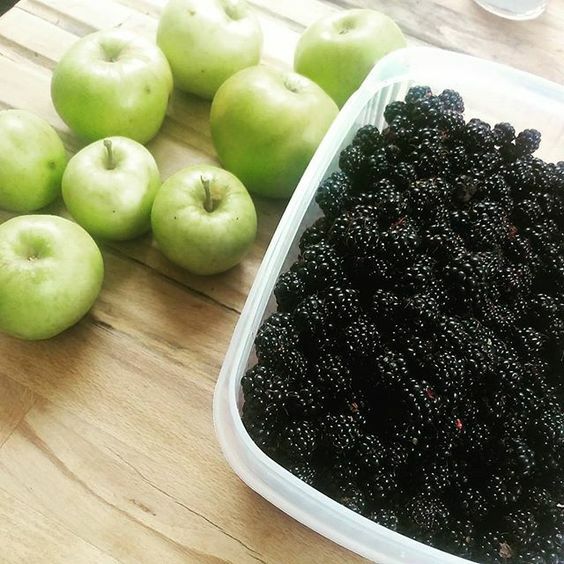 I find it hard to resist picking blackberries as I’m out and about; where we live, we have a load of wild fruit growing nearby (a bonus of living on the edge of the South Downs), including apples, sloes and plums. We also have an apple tree in the garden that grows the blandest. apples. ever. They’re only actually any good in jams, jellies and chutneys. 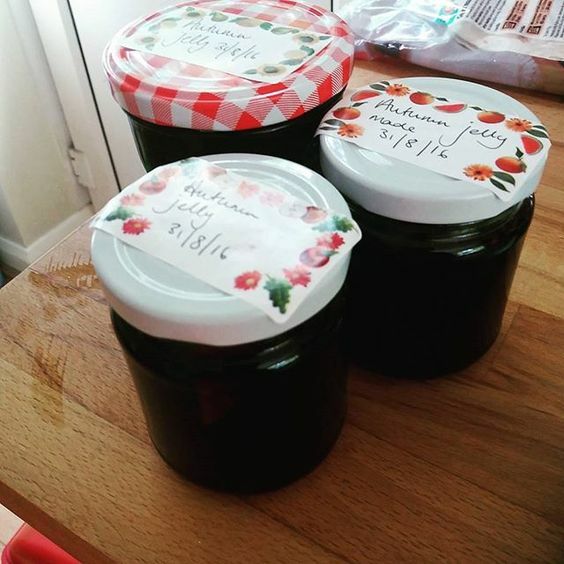 Although my apple chutney is quite popular, I haven’t quite got the recipe right yet- but I thought I’d share my autumn jelly recipe with you, along with pictures which I Instagrammed when I was making it. 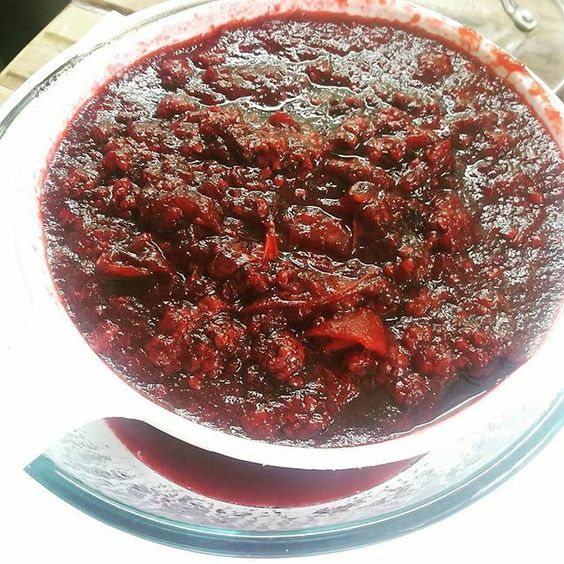 Ingredients: we picked just shy of 1kg of blackberries and used about 500g of cooking apples. A lemon is also needed at this stage. I try not to pick fruit by the road, as cars can affect the berries. Obviously I buy the lemon! 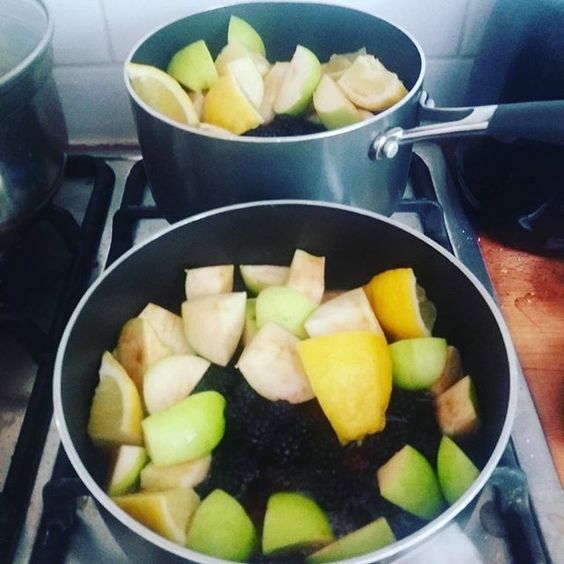 First things first- wash the berries and apples and roughly chop the apples and lemon and put them in a pan with about 300ml of water. I had so much fruit that I needed to use two pans! 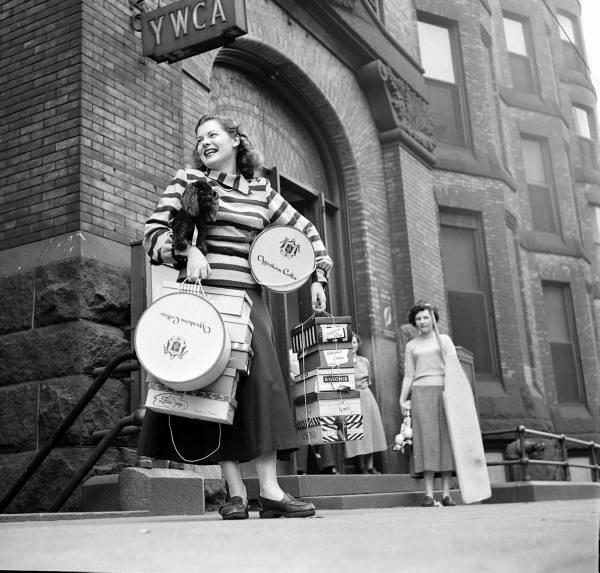 (Make sure they’re fairly heavy, btw.) Bring the water to the boil and then simmer for about 40 minutes, until the mixture has thickened. Keep an eye on it, keep stirring it and make sure that the fruit doesn’t stick to the bottom of the pan. Next, the messy bit! 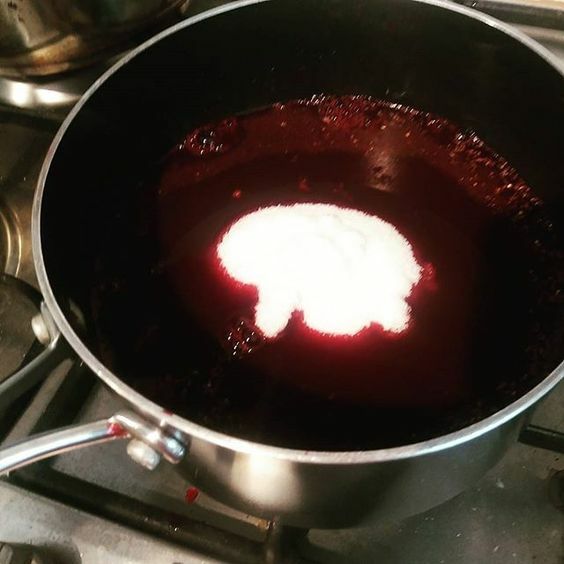 I always think this looks a bit like the aftermath of a horror film (and be aware that blackberries WILL stain wooden worktops. ASK ME HOW I KNOW.) Anyway, empty the pans out into a sieve-I prefer a plastic one-and place it over a bowl in order to collect the juice. Last year, I left the fruit to drain overnight. This year, it took a couple of hours. It’s worth keeping an eye on. This is the juice that will be turned into the jelly. 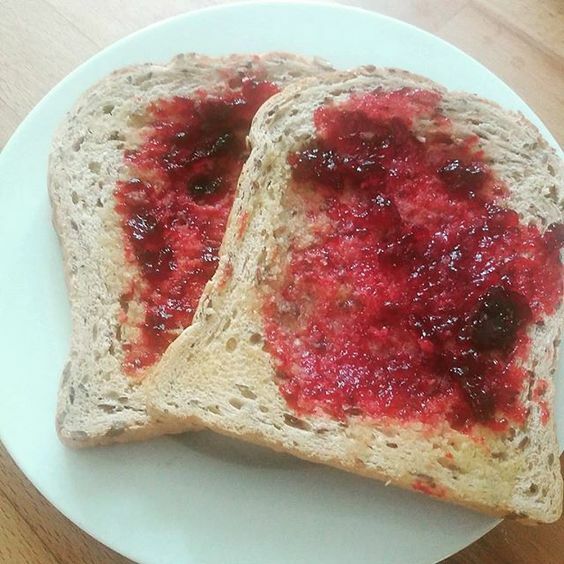 Conventional wisdom states that you should add 450g of sugar (I usually use bog standard granulated, but am looking into using jam sugar to see if it speeds up setting) for every pint of juice. I had a pint and a half, so used about 625g of sugar. I also add spices: cloves, cinnamon and ginger- about a tsp of each- but you could use more or less according to your tastes. 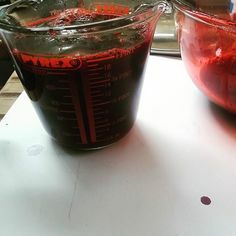 Next, next you need to bring the mixture to the boil and then-in theory- boil rapidly for 5-10 minutes until the jelly passes the ‘set test’: drop a small amount of jelly onto a cold plate (I stick a couple in the fridge before I begin boiling the fruit) and prod it with your finger. If it has a ‘skin’ and you can leave a trail in the jelly, you’re set. This took a bit longer to get to setting point- 20 minutes- but it was worth it! Skim the cloves and the foam on top and pour quickly into warm, sterilised jars. I sterilise jars by running them through the dishwasher. If they cool before I need them, I’ll fill them with boiling water until I need them. As soon as you’ve poured the jelly in, stick a lid on (I don’t bother really with those jam seals in jars- it hasn’t caused a problem before…) and label it with the date. Leave to cool in a cupboard. Once opened, store in the fridge. An open jar lasts about six weeks, if it’s not eaten first! Let me know if you have a go! So wonder no more, mystery friends! I thought I’d share my tips on how to navigate the online thrift shop with ease and (hopefully) style. It’s really handy to know what size you are in certain shops- for example, I know I’m a 14 in some and 16 in others. I also make decisions based on whether I think a particular garment will be comfy/flattering in a bigger or smaller size. Be warned though- some shops’ sizes have got smaller in recent years. Damn recession. I love Monsoon clothes, but am rarely able to afford to buy from the store- so I often keep an eye on what’s new on eBay. I know that Next, M&S and Dorothy Perkins often offer things I like and I always avoid Primark on eBay. It never lasts and is often priced way up more than it should be. I also find H+M to be hit and miss with sizing, so I try to avoid it if I can. It’s often handy to have a saved search for these things. 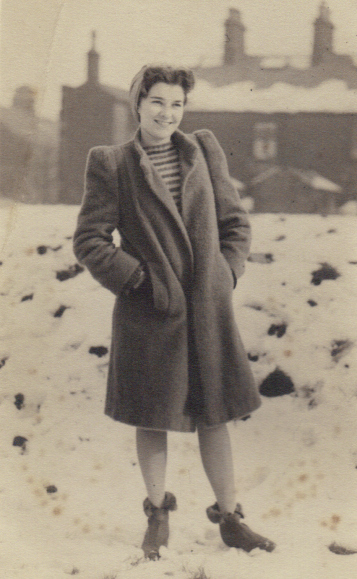 I just bought a brand new Next winter coat for a tenner (and £3 p+p). Last year I bought some calf length DMs in the middle of July for £50. Buying out of season means you beat demand and can snag some bargains. It’s really easy to get carried away on eBay, so I think of what I’m after and how much I want to spend. Then I take a look at the Buy It Now options first, as you’re paying a fixed price. I’m also a great fan of seeing these lots from the ‘lowest price first + P+P’ angle. 5. 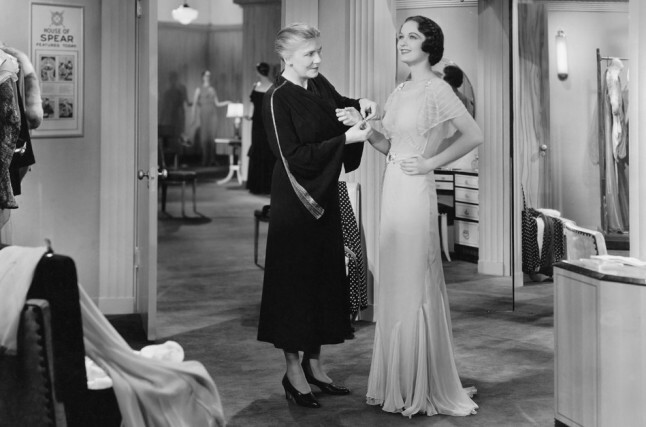 Think about what you like- and will you really wear this dress? Some of the eBay mistakes I’ve made have been when I’ve bought something that is really not my thing (for example- high heels. I never wear high heels, so why I thought I’d wear some patent pink stilettos is beyond me. Yellow makes me look washed out if I wear too much of it and pleated skirts make me look like I have the legs of a wrestler. So if anyone can explain why I bought a mustard dress with pleated skirt, I’d be interested.) So I stick to things I like. Mostly skater dresses with birds on. Also, never fall for that part of your brain that says ‘Oh, I’ll alter it!’ 1) You won’t and 2) that way, madness lies. Sometimes, no matter how well you’ve planned your shopping spree, you end up with a dud. It happens. If it does, I either resell, give to a friend, or (more likely) donate it to a charity shop. Do you buy from eBay? What are your top tips? I love Christmas. 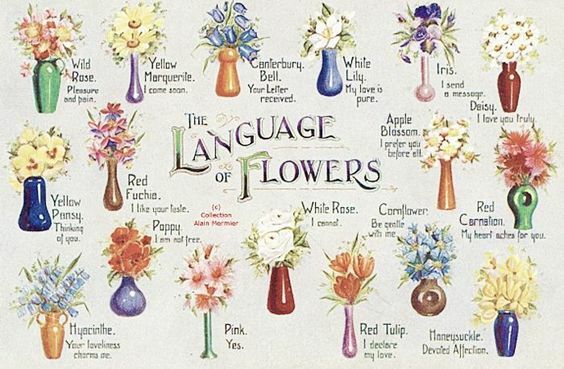 I especially love it at the moment because D is find the whole thing equal parts interesting and bewildering (I’ll refrain from saying ‘magical’. He thinks the Universal logo at the start of a film is ‘beautiful’. The kid has no concept of magic.) Unfortunately, he also has a penchant for helping himself to decorations off the tree, so my beautiful Nordman Fir is frequently denuded and its carefully placed* baubles are now all over the place. 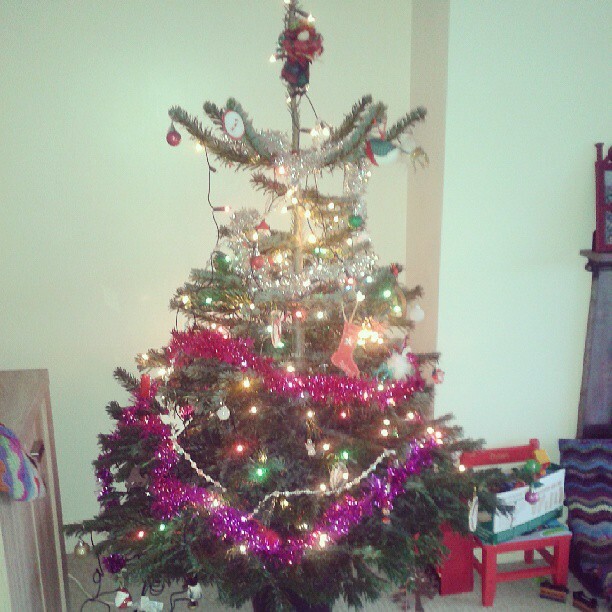 Between the toddler and the cat- who likes to see if it’s possible to climb up the tree without me noticing- my poor tree looks like it was decorated by aliens with no concept of taste. Christmas has also coincided with the onset of the Terrible Twos, which have come about WITH FORCE. Hooray. I’ve also done a little Christmas knitting, but decided to limit myself to one present, as I left it too late to co-ordinate myself efficiently. 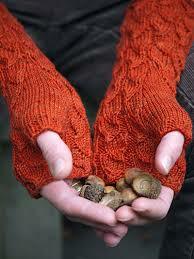 So I’m making a pair of Fallberry mitts in Drops Alpaca for a friend- lovely pattern and lovely yarn! I’ve knitted this pattern before, so I know it’s a quick(ish) knit that looks lovely. 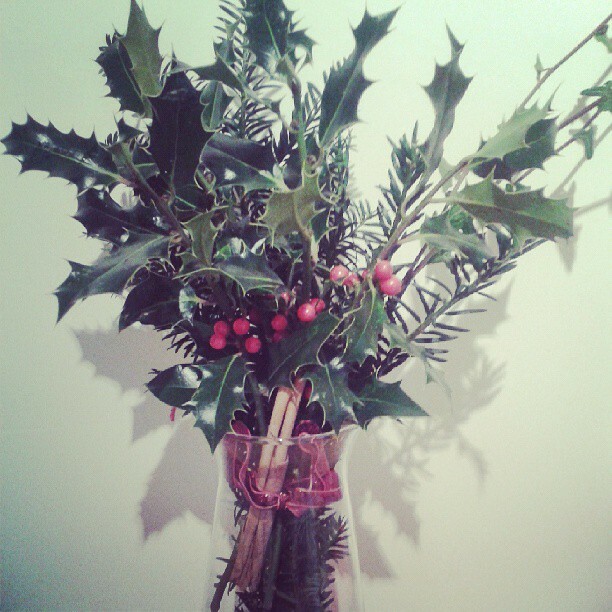 How are you preparing for Christmas? On Wednesday, I’m going to post about how I’m getting organised for hosting Christmas this year… Leave any tips in the comments! I’ve been promising to write up this recipe for ages- it’s a Saturday night staple for us, especially in the autumn and winter (it’s a handy ‘lap dinner’ that we eat when watching Strictly.) I can’t remember where I got the original recipe from, but it’s definitely evolved over the years. It’s pretty healthy and low fat and best of all, it’s very easy and customisable- I wish I’d known how to make this dish when I was a student! Now, I don’t want to get your hopes up, but I’m not the new Nigella. As well as what you can see here, I add a couple of cloves of garlic and a touch of ginger (which, brilliantly, Benn forgot to buy.) 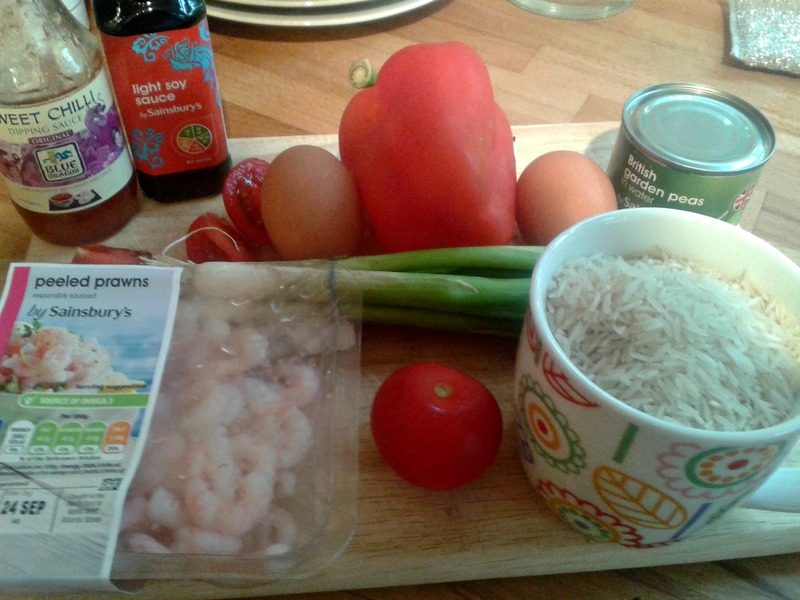 The ingredients above: prawns a bunch of spring onions, two small-ish tomatoes, a small tin of garden peas, two medium eggs, a red pepper, a cup of basmati rice, sweet chilli dipping sauce and light soy sauce. Once the rice has cooked, I drain it and let it cool. I fry the garlic and scramble the eggs in the wok/pan. Then I add the prawns. 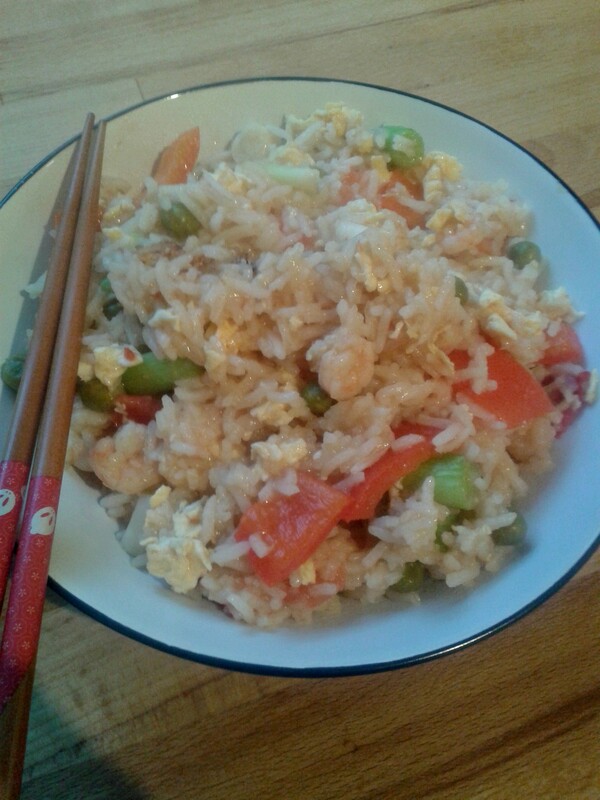 Then, once those are cooked, I add the veggies and a mix of the chilli sauce and the soy sauce, until I like the taste. I told you this wasn’t complex! 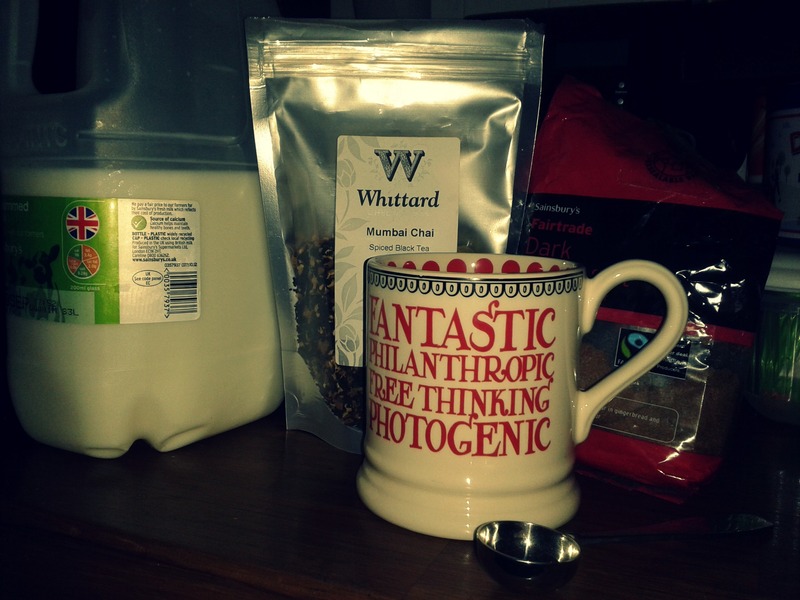 I’ve been reviewing various brands of chai recently and was very impressed with the Whittard’s blend, Mumbai Chai. As I realised it had a very authentic spice mix, I decided to have a go at making my own chai latte with it. I did some research on the internet and found lots of ways in which you can make your own Chai Masala, even down to the spice ratios. However I decided that, for now, I would stick to using a pre-prepared tea. I did decide to forgo the traditional buffalo milk for some regular semi-skimmed… I know that some people use condensed milk, but I think that would be a bit too sweet for my tastes. 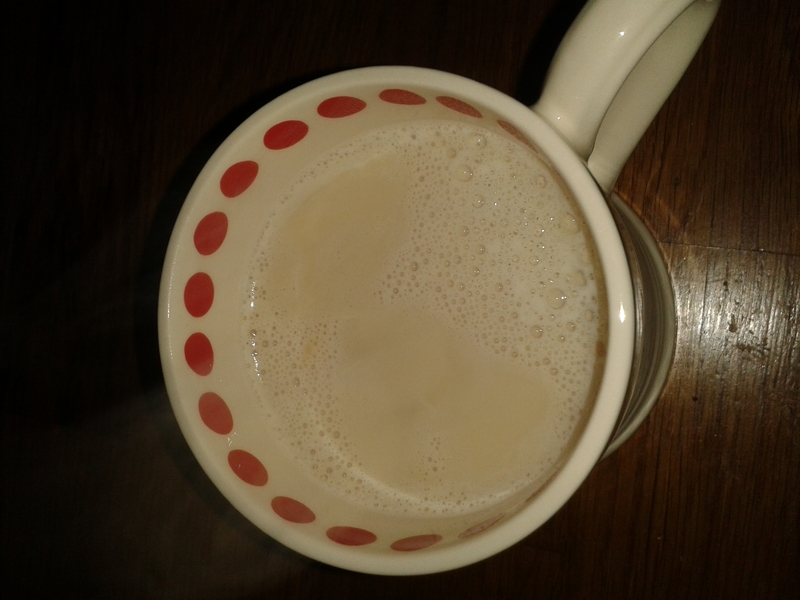 I decided not to use a filter on this to show you how the sugar coloured the milk (which I measured out using my mug. Nothing fancy here!) I put two generous teaspoons of the chai into a tea filter and let it sit in the heating milk. 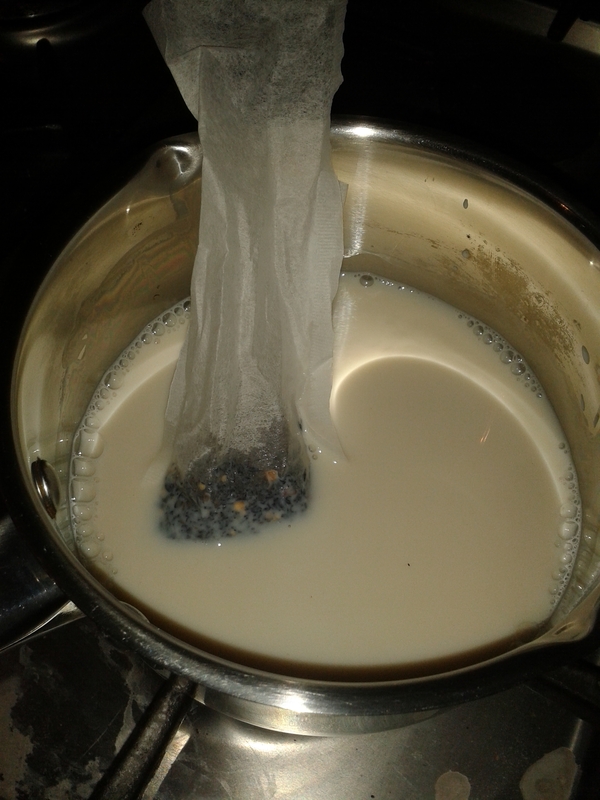 When I do this again, I am tempted to let the tea go loose in the pan and strain it off afterwards. I also didn’t let this warm for long enough to get a real kick, so I would advise you to heat on a lower heating for a long time. I read somewhere that proper chai is made all day on a low heat. I had a film to watch and a cat who is likely to stick her head in the pan if I don’t keep an eye on her, so I didn’t have that luxury. I took the milk off the heat once it started to get to a rolling boil. This is the finished product! Again, no filter, so you can see the colour. Although not as strong as I would have liked, it’s not bad for a first attempt; there was definitely a kick and the sugar added a lovely richness to the overall flavour. It was also much nicer than my usual Starbucks chai latte, less sugary and synthetic. Let me know if you have a go at this- it really is super easy! Making my nail polish last longer! This stuff is AMAZING. I have honestly seen a difference in nail polish wear after using this as described in the Sticky Sandwich method. It is pretty expensive when compared to other basecoats, but I consider that for the price of a manicure done in a salon, you can get this and a decent topcoat, it’s not a bad price for something that works. I am impatient and a bit cackhanded when it comes to manicures. I bought this with my Boots points after my friend Alice recommended it to me. It is fabulous- dries SO quickly, although I am aware it dries up in the bottle eventually. I’m not at that stage yet, but may see what other fast-drying coats offer (suggestions of good ones in comments would be appreciated!) I’m not patient enough for a normal drying time and I don’t like Sally Hansen topcoats! By making these little changes, I’ve found that my nail polish can last up to five days chip free. After this point, I find that I get bored anyway and want to change the colour! The polish definitely has more wear and can cope with hair washing, dish washing and the demands of a baby, so I’m happy. What are your nail tips?